The RealMe U1 is the world’s first smartphone, which is powered by a MediaTek Helio P70 processor. We are comparing the device with the Honor 8X to see which smartphone offering the best hardware on paper. 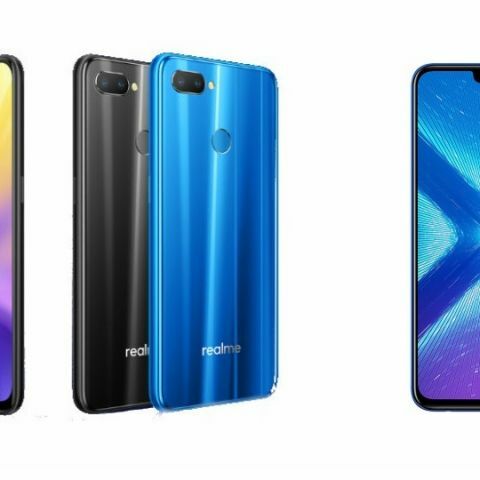 The RealMe U1 has recently launched in India with a starting price of Rs 11,990. The phone comes in two variants 3GB/32GB and 4GB/64GB, which is priced at Rs 14,999. The smartphone comes with a 6.3-inch display that features a teardrop notch on top. On the other hand, the Honor 8X, which was launched this year at a price of Rs 14,999, comes with a Kirin 970 octa-core processor. 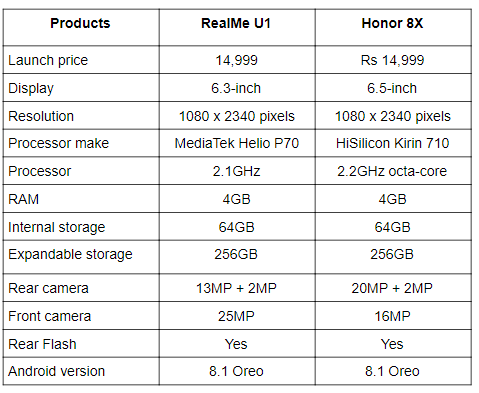 So, let’s begin with a quick specification comparison to know which one is better in terms of specifications. The RealMe U1 sports a 6.3-inch display that offers a resolution of 1080 x 2340 pixels. On the other side, the Honor 8X comes with a slightly bigger 6.5-inch display that also offers the same resolutions as the RealMe U1. When it comes to the processor, the RealMe U1 is powered by a MediaTek Helio P70 processor. As I mentioned earlier as well, it is the world’s first smartphone that features a MediaTek Helio P70 chipset. On the other hand, the Honor 8X is backed by a Kirin 710 processor, which is paired with 4GB RAM and 64GB internal memory. As far as the cameras are concerned, both devices are equipped with a dual camera set up at the back. The RealMe U1 sports a dual 13MP + 2MP rear camera, while the Honor 8X comes with a dual 20MP + 2MP rear camera. At the front, the RealMe U1 have a 25MP unit, while the Honor 8X comes with a 16MP front shooter.